In the previous slide, we saw that 45% of tech buyers said they were purchasing access points (APs) to upgrade to the latest Wi-Fi standard. 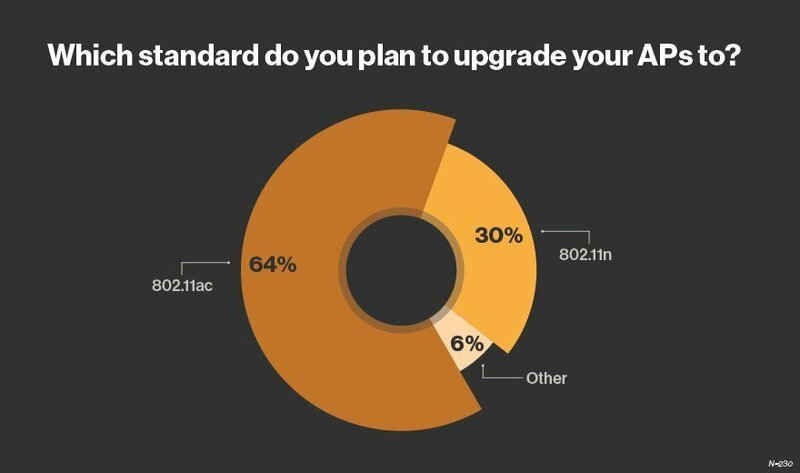 We asked survey respondents to identify which standard they planned on upgrading to, and the majority of customers -- 63.5% -- cited the 802.11ac standard. The appeal of 802.11ac is quality of experience rather than speed, according to Lisa Phifer, owner of Core Competence. "While 802.11ac offers gigabit data rates -- theoretically maxing out at nearly 7 Gbps [gigabits per second] -- real-world data rates are considerably lower and typically constrained by the type of Wi-Fi client. However, 11ac users will experience much faster data rates over greater distances with fewer drop-outs, so it is not necessarily speed but quality of experience that drives customers to upgrade to 11ac," she said in an email. Customers with 802.11n APs can experience the following pain points: poor application performance, for video in particular; user congestion; dead spots; or frequent loss of connectivity. However, by upgrading to the first or second wave of the 802.11ac standard, they will see "marked improvement," she said. Deploying devices that support the 802.11ac standard makes the most sense. "At this point, there is little incentive to install a new AP that does not support 11ac. Prices are competitive for APs that support 11ac, and Wi-Fi technology has improved considerably since the days of 802.11n," she said. Ramon Thomas, pre-sales engineer at Force 3, noted the widespread adoption of second wave of 802.11ac is on the horizon. "A lot of customers are actually spinning up and increasing their wireless network capabilities in order to support Wave 2," he said. But the real question for tech buyers, Phifer said, is when to do "a rip-and-replace AP upgrade -- either from 11n or from the first wave of 11ac" -- to Wave 2 802.11ac products. "Customers who have first wave 11ac may want to wait a bit to replace APs with second wave 11ac, unless they are experiencing congestion, as multi-user MIMO [multiple input, multiple output] and the underlying beamforming technologies are relatively new," she said. Are your customers talking about Wave 2 of the 802.11ac standard?